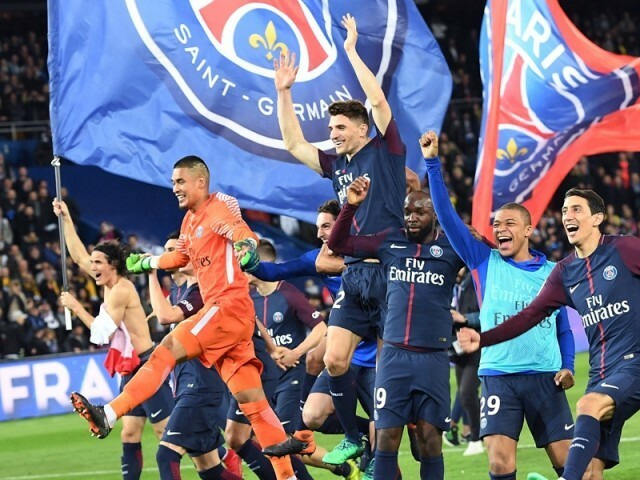 PARIS: Paris St Germain claimed their seventh Ligue 1 title in emphatic style with a 7-1 home win against defending champion AS Monaco on Sunday. On the other hand, Manaco coach Leonardo Jardim reveals that his team’s realistic chance was to secure Champions League spot. “Our great goal is the Champions League; it’s not easy but we’re going to work hard for it. It is possibly my worst defeat as a coach,” he said. In the space of seven minutes, PSG took a three-goal lead. Lo Celso tapped in from Alves’s cross from close range in the 14th before Cavani beat Danijel Subasic with a powerful downward header, sending the home crowd into raptures three minutes later. In the 20th, Di Maria beat the offside trap to collect Cavani’s through ball and lob over Subasic. Seven minutes later, after a one-two with Cavani, Pastore whipped a perfect cross that Lo Celso headed home. Monaco lost fullback Djibril Sidibe with a possible knee injury that could impact France ahead of the World Cup in June and July. “I think it is a serious injury,” said Jardim.